It’s the first peace in a thousand years. The New Kingdom and Telesia have agreed to set aside their centuries old quarrel over land and culture for this alliance of peace. This fragile alliance brokered by the newcomer to the throne is about to be put to the test. Alex, the new king, meets and falls in love with Lydia, a fisherman’s daughter from the east. His family and friends are outraged. Plans have already been put into place and Lydia’s appearance jeopardizes the alliance. In the author’s own words, “The story is about love, betrayal, death, loyalty, madness. It’s about a fisherman’s daughter who falls in love with a king, and how they suffer the worst kind of betrayal from one they trusted.” I chose to use the author’s own words because I feel they best describe the story, but also because they are what keeps the story moving. There is no stall out with this story. It is suspenseful. It is the type of book that grabs you and won’t let you put it down until you’re done, even if it means burning some midnight oil. At first glance, I thought this book was just another romantic novel. I was tempted to lay it down, but was glad I didn’t. It has enough twists and turns to keep you guessing, and even when there is a little bit of predictability, it has enough momentum to carry you over those areas, because even when you think you know what will happen, how and when they happen are a mystery. The author does a good job of holding your attention. 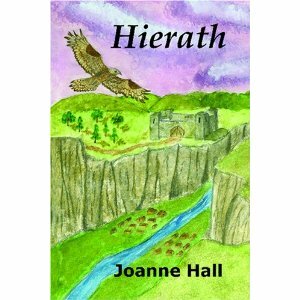 Hierath is the first book in a trilogy of fantasy stories by author Joanne Hall that is filled with twists and turns. Alex the Prince of Hierath drags Lydia from the water after she is struck on the head by a fleeing deer and faces the ice bridge to Avenhelm before Alex and Valery drag her from the river and revive her. Lydia is too pale to be an enemy Northern Telesian and Alexander III, Ruler of the New Kingdom, decides she is to be taken back to the healer at Hierath Castle to recover. Lady Ammaline rules the Council of the Kingdom and the Prince and takes an intense dislike to Lydia. Treachery is ripe in the Kingdom of Hierath, and trouble is indeed waiting for both Alex and Lydia on his return. characters to carry the ending of the story into the second book in the trilogy by Joanne Hall. An enjoyable fantasy. Hierath by Joanne Hall (238pp, ISBN0978977222421) is the first volume of an epic new fantasy trilogy that looks set to extend beyond the original three books in the same way as other series such as Terry Pratchett’s Discworld and Raymond E Feist’s Riftwar series have, and which will appeal to all connoisseurs of magic and sword and sorcery. On a world very much like ours, the most obvious difference is that there are two moons and magic works, two young young hunters find a young woman lying unconscious by a pool. They rescue her from an attack by creatures lurking in the pool, and take her back to the castle of Hierath. As she is convalescing, the young woman, Lydia grows attracted to one of the men Alex, before learning that he is the ruler of the little Kingdom. By contrast, Lydia is a commoner whose parents died in a recent famine, and is travelling through the kingdom to stay with relatives. Alex is an uncommonly egalitarian ruler, in stark contrast to his aunt, who has plans for her nephew that she hasn’t bothered to consult him about. Aunt Ammaline is furious that those plans are disrupted by a mere commoner, and with the aid of her accomplices sets out to rid herself of this troublesome newcomer. The King is entirely unprepared for treachery from those close to him, and his furious response escalates the conflict, until Hierath stands on the very brink of war. It’s a richly drawn and complex world, full of well-drawn characters; the heroes are heroic, while the villains are suitably malevolent, and there is a fine show-down with the forces of darkness. The Electronically Published Internet Connection (EPIC) is a writer’s organization that is geared solely to electronically published writers. Those writers published in old-fashioned print books are not specifically excluded, but the criteria is that they must be published in e-book format. Many long-time genre writers are dismissive of such organizations, but the reality is that electronic publishing is not going to go away, and that the only way to raise standards is to participate rather than to ignore the field. The EPPIE Awards, which are given by EPIC each year, is one such mechanism, and Hierath –having come from nowhere– was selected as a finalist for the best fantasy novel, a massive honour for a first novel by an unknown Briton. I used to think the worst villains were the ones who had no reason for their actions, Joanne Hall has proven me wrong. In her novel Heirath she has created the worst villains I can imagine because their reasonsfor their evil are the good of the kingdom and you begin to understand why they have done the terrible things they have, even though you can never forigve them. There had to be a better way! The main characters, although act a little young for their age and station, are well rounded and loveable. You find yourself wishing with all your heart that they have a good ending and that love will conquer all, but Joanne has already put them through so much pain and struggle and the situation is impossible, if they marry then war will be brought down on an already tird and money strapped kingdom which just wont survive. This book is filled with intrigue, love, hate, death and betrayal. It is unputdownable and heartbreaking. Joanne Hall is a truly fantastic writer.